I think we can all agree that Thanksgiving wouldn't quite be Thanksgiving without Pumpkin Pie. And I think for the most part we can also agree the pumpkin pies we typically enjoy are subtle variations of the same recipe. I propose this holiday we try something different. 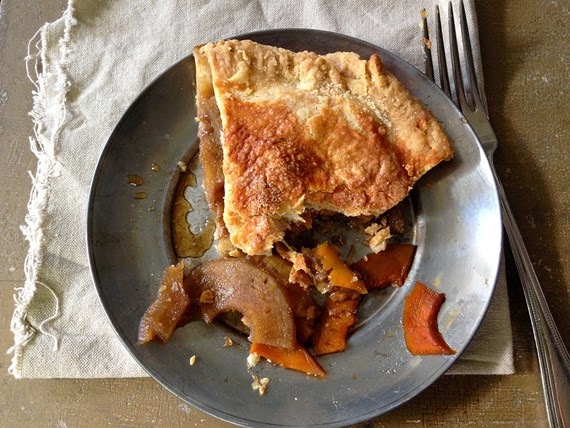 At a recent Masters of Social Gastronomy event starring no other than the All-American Pie, food historian Sarah Lohman mentioned an intriguing pumpkin and apple pie recipe that peaked my interest. She kindly shared it with us on her website Four Pounds Flour, and I'm passing it on to you. Like me, you too might find this recipe a little too pared down and difficult to follow. Luckily for us, Sarah broke it down into a recipe form we're more familiar with. Gardiner’s recipe is great for a deep-dish pie, but I’ve halved the quantities for the shallower red and white enamelware tin pie pan I have in my culinary collection. Pie pumpkins are smaller, sweet pumpkins that are usually labeled as such. Mrs. Gardiner's Apple and Pumpkin Pie doesn't call for seasoning but here are some of Sarah's suggestions if you prefer your pies with a little more kick in flavoring. 2 teaspoons mixed baking spices, such as cinnamon, nutmeg, etc. Preheat oven to 375º Fahrenheit. Line a pie plate with the bottom crust, and sprinkle with ½ cup of sugar. Lay apples on top, then a layer of pumpkin slices, and sprinkle with another ½ cup of sugar. Continue until pie plate is full, then top with butter and your choice of seasonings. Add the top crust, sealing the edges, and cut steam vents in top. Bake about an hour, until browned and juices bubble through the vents. Let cool overnight.